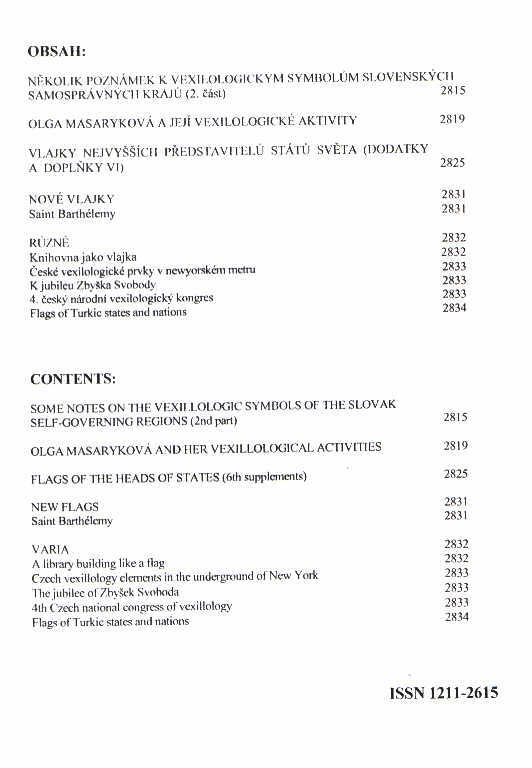 František Pícha, an eminent Moravian vexillologist compares the procedure of the regional symbols´ adoption in Slovakia to that one applied in the Czech Republic in his article which continues from Vexilologie No. 145. While Slovak regional authorities – unlike in the Czech Republic – are fully entrusted with their adoption and the central administration is relatively vague with their official registration at the Interior Ministry only, their display and legal protection is stipulated in Slovakia in more details and with a stronger legal background than in Czechia. Consequently, Pícha evaluates those differences from the point of view of the final design of Slovak regional flags – “a Scandinavian quartering” of their surface in basic armourial colours that issues in a certain uniformity of them. However, all of them meet criteria of modern vexillology, indeed. Unlike in the Czech Republic, Slovak regions´ leading officials – presidents - display their own vexillological symbol – a banner designed in the unified pattern given by the Interior Ministry in form of an armourial flag derived from the respective quite complicated and composite arms. Moreover, Slovak self-governing regions also use their flags in form of flying and/or hanging banners, i.e. in the way that is not recommended in Czechia. Aleš Brožek, a leading Czech author on vexillology continues his series of articles dedicated to Czechoslovak personalities connected with inception of Czechoslovak national symbols in 1920. Daughter of the Founder of our independent State, President Masaryk, Olga was vexillologically active at the Czechoslovak National Council seated in Washington, D.C. (USA) after her arrival in May 1918. Namely, she was an author of a basic heraldic and vexillological document of the Council “The Czechoslovak Flag – Historic Coats of Arms of the Czechoslovak Lands” published in October 1918. She aimed to suppress disputes on choice of a new State’s national symbols or that of its representative body among the emigrant circles and to make acquainted American public with our historical symbols. Olga Masaryková supported the historical flag of Bohemia (W over R) for National flag of Czechoslovakia against both new models preferred by different groups of Czech and Slovak fellow-countrymen living in the USA and influenced by their “Stars and Stripes” model and the symbol of the Council designed by M.R. Štefánik, another leader of the liberation movement.